In case you’ve never heard of the US Department of Agriculture’s (Farmers) Bulletin No. 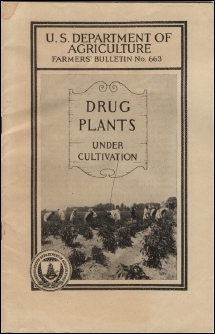 663 entitled “Drug Plants Under Cultivation” [1934/1935], dealing with the subject of Medical Plants and Herbs ---- There’s a good reason; Medical Cannabis is no-where to be seen. However, now through documents found via the National Archives (College Park, MD), we’ve found out that IN FACT, the original publication of the Bulletin DID INDEED contain references to Cannabis. But that Harry Anslinger (through the use of his Bureau of Narcotics) had the pamphlet modified (taking out all references of Medical Cannabis), and had it reprinted. Documents show that the government even went so far as to destroy all of the original copies. All documents have been doctored for reduced download time, if needed feel free to ask for scans of original copies. WARNING – Due to the age, plus conditions of the original documents, some transcriber errors have no doubt been made. Please make references to the originals for legal purposes. The Narcotic Bureau of this Department has been advised that your Department has issued some bulletins, evidently for the information of farmers, which give information upon the manner of cultivating within this country the opium poppy and Cannabis sativa. May I request to be advised whether any such publications have been issued within the past several years? This Department, through its Narcotic Bureau, has sought to discourage at least under present conditions of supply, and respectfully urges that, in the interest of securing adequate control of the drugs derived from these plants, that no bulletin which may encourage such cultivation be issued. Receipt is acknowledged of your letter of January 10 with reference to the reported practice in this Department of furnishing bulletins to the public dealing with and encouraging the growing of the opium poppy and Cannabis sativa, and requesting that the Department, in case the report is correct, discontinue the practice in the interest of securing adequate control of the drugs derived from these plants. The Bureau of Plant Industry reports that the situation is substantially as follows: The division of Cotton and Other Fiber Crops and Diseases issued a mimeograph dealing with the growing of Cannabis sativa as a fiber crop. When grown for this purpose, the crop is harvested before it reaches the stage when the drug can be obtained from it. Inasmuch as its culture as a fiber crop is well established in some sections, and is a legitimate enterprise, it does not seem advisable to discontinue or restrict the furnishing of information on the growing of the plant for that purpose even though the plant could be diverted to the production of the drug by persons acquainted with the methods of accomplishing this. In the Bureau’s Division of Drug and Related Plants no information on the growing of Cannabis sativa for drug purposes has been given out for a number of years in reply to specific questions, the correspondents’ attention being called to the prohibitory legislation passed in many States and to the prevailing public opinion against the introduction of the plant. However, information on the subject is included in Farmers’ Bulletin 663 – Drug Plants Under cultivation – which contains cultural information on many of the important drug plants. This bulletin is in considerable demand and is exceedingly useful for answering inquiries on medicinal plant culture in general. The supply of the present edition of the bulletin is expected to be exhausted toward the end of the present year at which time it will be revised and the item in question eliminated. The bureau has no publications on the growing of the opium poppy. It receives numerous requests for information on the growing of poppies but the great majority of these have reference to the production of poppy seed for the bakery trade. These are replied to by means of a brief typed statement which consists of no more than is usually given on the package in which the seed is furnished by commercial seed houses. Here again the bureau makes the suggestion that it would be inadvisable to deny information on growing poppies as a seed crop on the ground that informed persons could divert the crop to the production of opium. When correspondents ask specifically to be furnished information on how to grow poppies for opium production they are informed that control of the production, sale distribution, etc., of opium is vested in the Narcotic Bureau. We trust that the Department’s procedure as followed at present, and as it will be when modified later with respect to the revision of the Farmers’ Bulletin referred to is satisfactory to the officials of your Narcotic Bureau, and that it will in no way interfere with their control of the drugs in question. Your attention is invited to the attached copy of Department letter of January 10, 1935 addressed to the Secretary of Agriculture, requesting information as to publications issued by that Department tending to encourage cultivation of the opium poppy and of cannabis sativa, and a copy of latter dated January 25th, only recently received, from the Department of Agriculture in reply. The enclosure to the letter of Secretary Wallace, being Farmers’ Bulletin No. 663 “Drug Plants under Cultivation” is also enclosed. I should be placed to receive the benefit of any comment you may desire to make upon the latter of Secretary Wallace. Referring to your letter of July 31, in regard to publications issued by Department of Agriculture, describing methods of cultivating cannabis sativa to the best advantage, I have read with interest and surprised Farmer’s Bulletin No. 663, “Drug Plants Under Cultivation”, a copy of which accompanied your letter under reply. The impropriety of having information of this kind in regard to cannabis circulated by the government seems to me obvious. I am surprised that the existence of this bulletin has not previously caused adverse comment either here or abroad. With the increasing attention that is being given to the subject of cannabis, I am afraid that we may any day be called upon, perhaps in the Opium Advisory Committee, to explain and justify the distribution of such information by the Government. I gather from the Secretary of Agriculture’s letter to the Treasury Department, dated January 25, 1935, that the only reason why that Department does not withdraw the present edition of Bulletin 663 at once is because it will cost money to print a new edition. However, I note that the bulletin in question is sold by the Superintendent of Documents at five cents a copy. Presumably that sale price covers the cost of printing. It would seem to me that the amount of money involved could hardly be sufficient to justify a continuation of the distribution of this bulletin in the face of the possibility that very disagreeable adverse criticism of the Government might any day result. If the Department of Agriculture has a thousand copies of the bulletin in stock, the amount of money involved would hardly be more than fifty dollars. I sincerely hope that your Department can prevail upon the Secretary of Agriculture to withdraw the present edition of Farmer’s Bulletin No. 663 from circulation, substituting therefor, if desired, an edition which will omit the reference to cannabis. Division of Far Eastern Affairs. Reference is made to the attached informal communication, dated August 6, 1935, from Stuart J. Fuller, Assistant Chief, Division of Far Eastern Affairs, relative to Farmers’ Bulletin No. 663, “Drug Plants Under Cultivation”, which described methods of cultivating cannabis sativa to the best advantage. This matter was taken up with the Editor’s Office of the Bureau of Plant Industry, Department of Agriculture, by the Administrative Office of this Bureau, and today the writer was notified that no Farmers’ Bulletin No. 663 containing the offensive matter is on file for distribution. In the reprint of this bulletin the subject under discussion has been deleted. I have your letter dated August 6, 1935, with reference to Farmers’ Bulleting No. 663, “Drug Plants Under Cultivation”, issued by the Department of Agriculture, which described methods of cultivating cannabis sativa to the best advantage. The matter was taken up with the Department of Agriculture, and I have been advised that there are now no copies of this bulletin, containing the matter under discussion, on file for distribution, and that in reprint of the bulletin, the proper deletion will be made. With reference to letter from this Department under date of January 10, 1935, to the Department of Agriculture, requesting elimination of the reference to CANNABIS in their edition of Farmer’s bulletin No. 663, Mr. Spruke, State Department, advises that they have just received a copy of Farmers’ Bulletin No. 663, revised in September, 1935, and that the undesirable portion relating to cannabis has now been deleted; also that all copies of the old Bulletin have been destroyed. In accordance with the provisions of Section 8 of the Act of June 14, 1930, as amended, entitled “An Act to Create in the Treasury Department a Bureau of Narcotics, and For Other Purposes,” I am required to cooperate with the several States in the suppression of the abuse of narcotic drugs in their respective jurisdictions. To that end, this Department has urged upon the various State Legislatures the necessity for enacting the Uniform Narcotic Drug Act, drafted by representatives of this Department in cooperation with representatives of the several States, and to include therein a provision for the suppression of the abuse of Cannabis Sativa, L. To date twenty-six of the States have enacted the Uniform Act and twenty-seven of them have placed on their statute books prohibitive measures designed to suppress the abuse of cannabis, which is becoming more and more a menace through the use marihuana cigarettes. This Department’s attention has now been drawn to Farmers’ Bulletin No. 663 entitled “Drug Plants Under Cultivation”, which it is understood is being distributed free of charge by your Department, and is offered for sale to the public at a nominal sum through the Office of the Superintendent of Documents. This pamphlet describes methods of cultivating cannabis to the best advantage, and it is believed that information along this line will be seized upon by those interested in its illicitly production and sale. It is realized that the reprinting of this bulletin would mean an additional outlay of funds by your Department, but it is felt that the amount involved could hardly be deemed sufficient to justify a continuation of its distribution, in the face of the possibility that very adverse criticism of this government may result, in the event the Opium Advisory Committee should call upon this country to explain and justify the distribution of certain of the matter contained in this bulletin. In requesting that the present number of copies on hand in your Department and in the hands of the Superintendent of Documents be destroyed, and that the latter official be requested to withdraw this issue from publication and sale, I feel that it is hardly necessary to decry any idea of international criticism of the action of your Department, and that none will be implied by you. From time to time occasions must arise where the aims of two or more Departments of the Government, all intended for the common good of the Nation, will be found to conflict; and it is respectfully submitted that in this instance the matter should be so adjusted as to avoid any possibility of national or international censure.